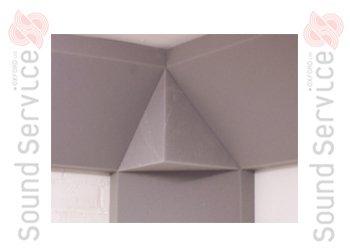 This specially developed sound absorbing corner cube is produced to fit into a tri-corner area of any room and compliments and increases the low end sound absorbency of our bass trap type Acoustic Corner Traps. Can help reduce bass reverberation in the room. 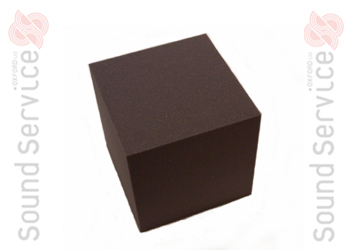 This specially developed 305mm sound absorbing corner cube is produced to fit into a tri-corner area of any room and compliments and increases the low end sound absorbency of our bass trap type Acoustic Corner Traps. Essential if you wish to bring a studio or music practice room under control and remove that annoying bass note build up often found in corners. Suitable for use with any of our corner traps with the exception of our Jumbo Trap. Available in the usual grey to match the Acoustic Corner Traps and some of our other products. These Acoustic Corner Cubes when used in a corner along with Corner Traps will enable you to much more effectively bring a room under control without distorting the music. IS THE FOAM FLAME RETARDANT? Yes. It meets the requirements of schedule 1, part 1 the Furniture and Furnishings (fire) (safety) Regulations 1988 (amended 1989). Also no CFC’s or HCFC’s are used in the manufacture of these acoustic foams, only water blown technology is used and no brominated compounds are used in the manufacture of these corner traps.